Well, another New Year crept up on us once again and once again I will commit to listing on the website! This all started way back in 2012 and several of us continued on in 2013, 2014 , 2015 and 2016. Just looking at everyone’s lists over the years you can see how varied our birding lives can be. As usual we got out and about on New Year’s Day and got the first one hundred birds onto the list, so now it will be a little harder or it means we need to travel beyond the town of Broome! Every year is different around Broome and with a few very dry years behind us and finally some much needed tropical rain we can hope to see some interesting birds arrive. The ephemeral lakes are finally filling up after completely drying out and the arrival of hundreds of Magpie Geese rather than a dozen or so is a welcome surprise. Our local Australasian Swamphen population had left when the last lake dried out, but finally we have seen the return of several dozen. It seems that the bird-life is well aware of a good “wet” season this year and are arriving in force! It may well make it very hard for us to access some local ephemeral lakes, but we are very keen walkers and so we won’t be deterred if we can avoid it! On 29th December a pair of Gouldian Finch were observed some distance from town feeding with a flock of Long-tailed Finches and Zebra Finches. The black-headed Gouldian Finches have remained in the same area feeding on the grass seeds with the other finches and were our 75th bird for 2017 and the male Gouldian Finch features in the header photo. It is not the brightest photo of a brightly coloured bird, but it was sat with its mate in the shadows and I don’t believe in disturbing birds for a better photo! It is a delight to have such a beautiful bird make it to Broome, because generally you need to travel a few hours to see them in the Kimberley. 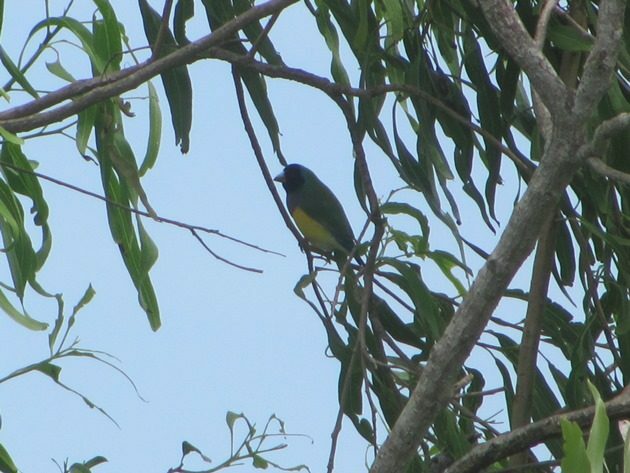 A variety of weather events will cause birds to wander further in different years and we have noticed this over the years that we have lived in Broome. Our garden list goes back many years and is updated each week and there are some obvious changes when you look back. No longer do we have flocks of Long-tailed Finches in our garden, but instead we have large flocks of Double-barred Finches. Once again I will use “Broome” to imply any bird that is no further than 70 kilometres from the Broome Bird Observatory, because that was a parameter set up many years ago. I will link past posts on species I observe where applicable and for any other posts you can click on Clare M. I have used “Christidis and Boles 2008 key to species names” until now, but due to the fact that it is not going to be updated into the future I will start to use the latest Birdlife Australia Rarites Committee list using IOC names. There is as usual no plan for the year ahead, but I can assure you it will involve birding each and every day. This is just observing nature around ourselves and enjoying whatever crosses our path. It is all about enjoying life and you won’t find me on social media! I may not even have phone reception for some days during the year, such is life in remote Australia! Thankfully I can post in advance and just “go bush”! I am looking forward to seeing the other Beat Writer’s lists at the bottom of the website as well this year and hope that they are all out there having fun! This list was last updated December 27th 2017. The bird species encountered in the UK are tagged on the bottom starting with the first bird in blue writing! Australians are tough! We will be OK! What kind of bird is an Alouette?